Executive Director of the Northside Community Development Fund Mark Masterson, Small Business and Redevelopment Manager for the City of Pittsburgh Henry Pyatt, and Jeff Daniels from Councilwoman Darlene Harris’ office. 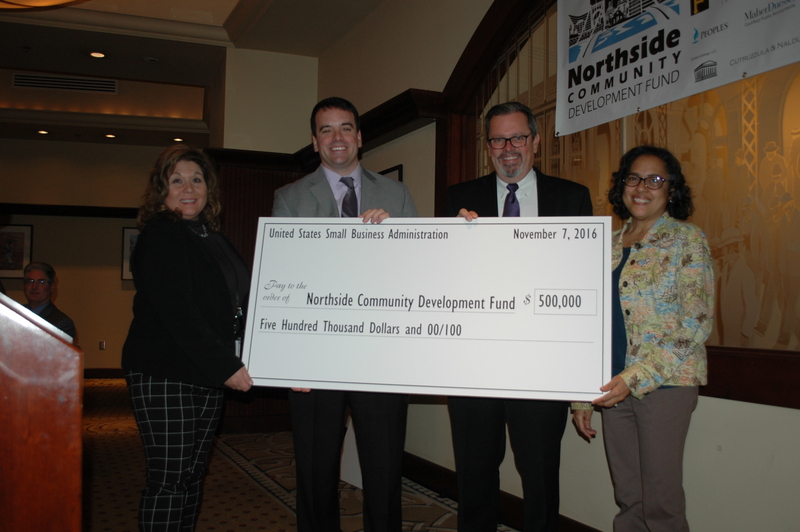 On Monday, November 7 the Northside Community Development Fund hosted its Annual Community and Business Luncheon held at the Lexus Club in PNC Park. The keynote speaker for the event was Auditor General Eugene DePasquale, who spoke of the advancements the Northside has made through the years and how the focus of the city is changing and revitalizing its neighborhoods. “We’ll always be the Steel City, but we have become the hub for health, education, and young entrepreneurs,” DePasquale said. Executive Director of the NSCDF Mark Masterson accepted three checks during the event that will be put towards furthering the funds mission. 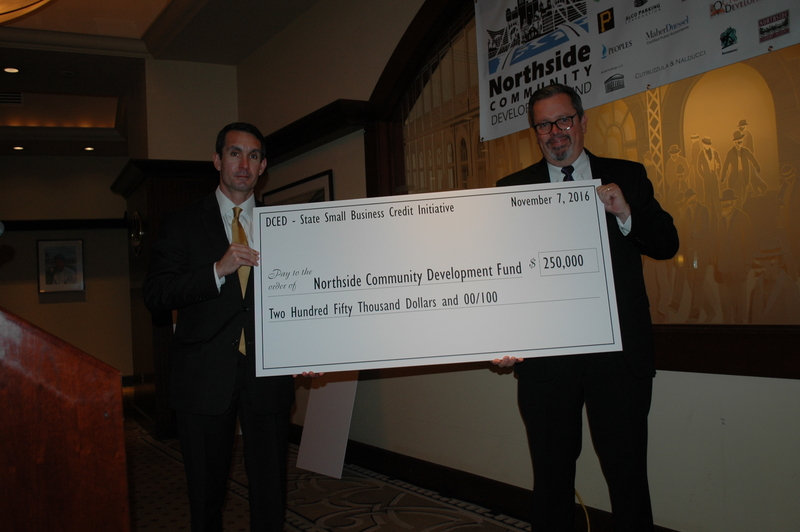 The NSCDF aims to provide financing and development services to promote community development and investment on the Northside and offer an array of financial products to achieve that mission. Left to right: Regina Abel from SBA, Joe Heffley from Congressman Mike Doyle’s office, NSCDF Executive Director Mark Masterson, and Judith Kirby from SBA. Bill Malloy, NSCDF board chair and ROAM Holdings president, held closing remarks on the funds initiatives that have been completed and those that are currently underway, such as the October Development project on East Ohio Street that will bring a 100 unit Comfort Inn hotel to the former ARC House building and creating 75-100 jobs in the process. Malloy also mentioned the affordable housing projects that are being built in Brightwood and Observatory Hill by the NSCDF in conjunction with the Northside Leadership Conference, the URA, Observatory Hill Development Corporation, Brightwood Civic Group, and support from Mayor Bill Peduto, Councilwoman Darlene Harris, WesBanco Bank and SSB Bank. Auditor General Eugene DePasquale and NSCDF Executive Director Mark Masterson. These projects are “helping to put home ownership back in the reach of working class folks,” Masterson said. The NSCDF has a total of 64 projects are either under construction or in the planning phases. Over the past five years, NSCDF has loaned more than $8.5 million to 90 non-profit organizations and small businesses. More than half of that total, nearly $4.4 million, was primarily used by non-profit community organizations to acquire and develop strategic real estate projects in their neighborhoods. The remaining $4.041 million was loaned to businesses, with 44% going to woman-owned business and 42% to minority-owned businesses. In a press release, Masterson praised the generous financial support of NSCDF’s partner, noting that the organization’s success is fueled by their commitment. Since 2001, the fund’s investments have leveraged an additional $21 million in outside financing. Sponsors of the luncheon included: Alco Parking Corporation; Allegheny General Hospital; Bookminders; Cutruzzula & Nalducci Attorneys; Eddy, DeLuca, Gravina & Townsend; First National Bank; Key Bank; Highmark Health; Huntington Bank; Maher Duessel Certified Public Accountants; Northside Leadership Conference; Northwest Savings Bank; October Development; Peoples Natural Gas; Pittsburgh Pirates; Pittsburgh Steelers—Heinz Field; PNC Bank; Priory Hospitality Group; SSB Bank; Roam Holdings, LLC; Strassburger McKenna Gutnick & Gefsky; The Wilson Group; Tucker Arensberg Attorneys; Urban Redevelopment Authority of Pittsburgh; and WesBanco Bank, Inc.